Creamy Creole style, cheesy turkey casserole that is baked in an oven for 25 minutes, and served over pasta. In medium nonstick skillet, over medium-high heat, sauté onion, celery, green pepper and garlic in margarine 4 to 5 minutes or until vegetables are crisp-tender. Add mushrooms and saute 2 minutes. Remove from heat. In medium bowl blend cream cheese, tomatoes, and creole seasoning. 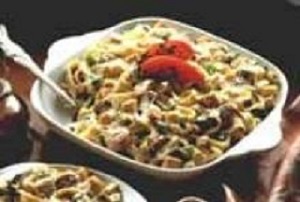 Fold in vegetable mixture, drained fettuccine and turkey. Pour mixture into 9-inch square dish, sprayed with vegetable cooking spray. Sprinkle cheese over top and bake in a preheated 325 degree F oven for 25-30 minutes or until bubbly. Recipe and photo property of National Turkey Federation. Used with permission.